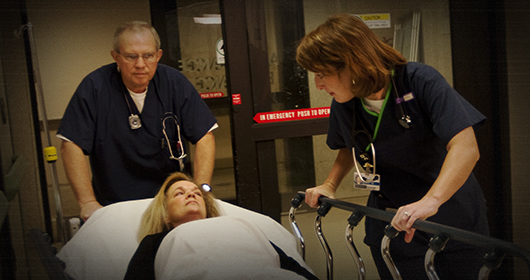 Southeast Health serves the emergency care needs of the region by offering quality emergency services 24 hours a day, seven days a week in the region’s only Level II Trauma Center. Our Emergency Services Department consists of 28 patient beds with specialized treatment rooms for major trauma and resuscitation, victims of sexual assault and other emergent needs. Evaluating more than 59,000 patients annually, which averages 150-200 patients daily, Southeast Health continues to make strides in patient care by providing the most effective emergency care to our patients. We have reduced the emergency department wait time significantly by implementing rapid cycle testing and a throughput initiative. The majority of our emergency department patients are treated and discharged; however, if you require hospital admission or a surgical procedure following your visit, be assured you will receive quality, compassionate care at Southeast Health. For more information about our emergency department, call 334-793-8111. As always, in case of emergency, dial 911.